The best of breakfast wraps, with a healthy kick! Made with egg whites. and both low fat ham and cheese, its hard not to eat both! 1. Cook egg whites, eggs, garlic powder and dill in a frying pan. Scramble up and let get fluffy texture. 2. Prepare wraps while eggs cook, slice up tomatoes and shred cheese. 3. 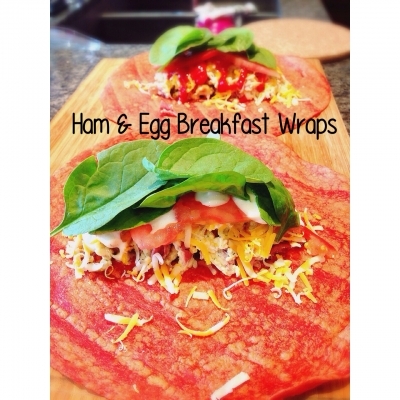 Once eggs are cooked, place in middle of the wrap and pile on the rest of your ingredients. Once done, fold in edges and roll in to make a wrap. Order I did: egg mixture, cheese, tomato, sour cream and spinach.